Here's my chart for this week. I've extended it to thirty songs as a top 30 always sounds more like a pop chart. Ten new songs this week. At the top is the latest mix by Robin Skouteris called Popalicious! It's a mix of all the pop artists that I now associate with Robin. My heart sank a little bit when I saw the Black Eyed Peas and their song The Time (Dirty Bit) was included as it's one of the worst songs of last year. However Robin has managed to make an awful song into something that works brilliantly within the mix. The video mix is by Panos T and it includes clips from artists who aren't even in the music audio mix which really adds to it. It's a perfect mix of old and new songs, in other words my kind of pop! The song at number two is Give In To Me by Leighton Meester and Garrett Hedlund. 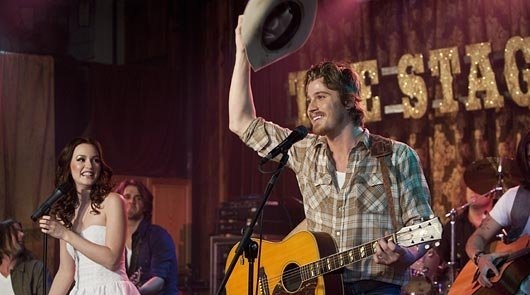 It's featured in the film Country Strong. The title song by Gwyneth Paltrow has gotten all the attention but I much prefer Give in To Me. It's unbelievable that the same actor is also starring in the remake of Tron at the moment. The video below is taken from the film itself and is just gorgeous. Both videos are below. Strike Curious Poses Chart: 17-1-2011 1 (-): Popalicious! - Robin Skouteris 2 (-): Give In To Me - Leighton Meester & Garrett Hedlund 3 (2 ): Rolling in the Deep - Adele 4 (1 ): I'm Here - Jennifer Hudson 5 (6 ): Me & you - Nero 6 (13): Limit to your Love - James Blake 7 (3 ): Smoke a Little Smoke - Eric Church 8 (15): Get Outta My Way - Kylie Minogue 9 (- ): Love Long Distance - The Gossip 10(8): My House - Hercules and Love Affair 11(7) Somebody To Love Me -Mark Ronson feat Boy George 12(5 ): Who's That Girl? - Guy Sebastian featuring Eve 13(18): The Art Of Love - Guy Sebastian featuring Jordin Sparks 14(- ): The Way We Were - Beyonce 15(4): young Blood - The Naked and Famous 16(9): Something in the Water - Brooke Fraser 17(11): Happiness - Alexis Jordan 18(10): Hold It Against Me - Britney Spears 19(- ): Black Box - Stan Walker 20(- ): Punching in a Dream - The Naked and Famous 21(- ): Stuck Like Glue - Sugarland 22(14): Stay - Hurts 23(12): your Song - Ellie Goulding 24(19): Higher - Taio Cruz featuring Kylie Minogue 25(20): Sunday - Hurts 26(17): Price Tag - Jessie J 27(16): Hello World - Lady Antebellum 28(- ): Pretty Girl Rock - Keri Hilson 29(- ): Oh My - Gin Wigmore 30(- ): Jigsaw - Ryan Sheridan Here's this week's number one Popalicious! as mixed by Robin Skouteris and video by Panos T.
And Give In To Me by Leighton Meester & Garrett Hedlund.